These horns were very easy to make following the instructions I found on "Cut and Keep" website. However after making the initial ones to scale I decided they weren't big enough so I copied the picture of the horn template from the site and enlarged it by 150%. Since I was using such thin fabric I decided to add some light-weight iron on interfacing to the back for stability. Then rather than sewing the horns to barrettes I simply folded the fabric over on itself on the bottom and glued the hole closed with "Fabric Tac", which can be found at Jo-Ann's. 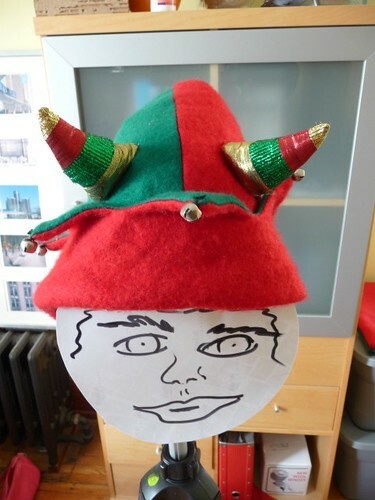 I also attached the horns to the elf hat with Fabric Tac rather than attempting to sew them in the right place. From my own experience though I will warn you that if you glue the horns on while wearing the hat there is a very good possibility that the glue with seep through the hat and get in your hair. Yes, this happened to me and fortunately I didn't actually glue the hat to my head, but I did have a hard time getting the glue out. So maybe tape some wax paper to the inside of the hat under where the horns will go if you plan on gluing it while it's on.